HomeJohnson Controls GLAS smart thermostat review: Hey Cortana, I’m cold! The GLAS smart thermostat is the most beautiful smart thermostat to hit the market since Nest shook the industry out of its complacency back in 2011. And just like Nest before it, GLAS manufacturer Johnson Controls has taken an approach no other thermostat maker has to date: It has embraced Microsoft’s Cortana digital assistant. Few would argue that the GLAS isn’t beautiful. The device is dominated by a 5-inch translucent OLED touchscreen that’s mounted to a small base housing the brains of the unit and its connections to your HVAC system. 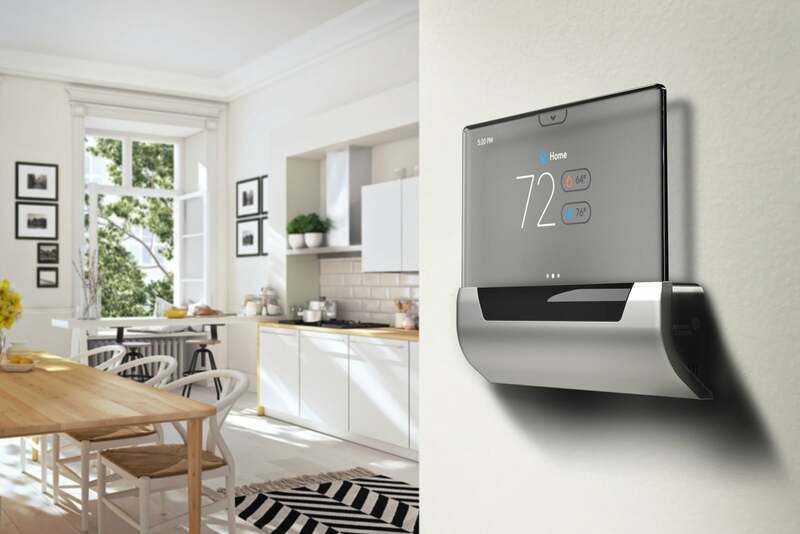 Unlike most other thermostats, which have their wiring connections on a backplate that the display half attaches to, the GLAS’s wiring is accessed from the front, hidden by a removable panel. The futuristic design looks as though could have been used in a science-fiction movie. In building the GLAS, Johnson Controls embraced not just Cortana but also Microsoft’s Windows 10 IoT operating system. The acronym stands, of course, for the Internet of Things, and this is one of the first consumer applications we’ve seen for the OS. As such, it’s a gutsy move on Johnson Controls’ part. But if that accounts for the GLAS’s $319 price tag, it’s also a dubious one. The ability of the GLAS smart thermostat to monitor your home’s air quality and enlist your HVAC system to improve it is a welcome innovation. On a day that I wanted my HVAC system to run just its fan to circulate the air in the house without conditioning it, I was able to use a voice command to turn off my air conditioner. But when I asked Cortana to have the GLAS run just the fan, Cortana responded with an in-depth explanation of how and why she could activate my PC’s cooling fans. And no matter how I phrased my request, I could not convince Cortana to return the system to its active cooling role. Johnson Controls was wise to make the GLAS compatible with Amazon Alexa and Google Assistant as well as Cortana, so you ultimately don’t need to worry if Cortana is up to par. And frankly, voice control is table stakes for smart thermostats today. The GLAS does a few things that its competitors don’t, but the style in which it does is it is where this product shines. The GLAS has the best touch interface of any thermostat I’ve encountered, including our current top pick, the Ecobee4. The current temperature and the target temperatures for heating and cooling are displayed on the main screen. You swipe left to view the air-quality monitor, and swipe right to see the status of your HVAC system (on, off, heat, cool, auto, and so on). Tap the tab at the top of the screen and the options menu appears. Where most smart thermostats are easiest to control via their mobile app, you never really need to use anything other than the GLAS’s own display; in fact, I found the device easier to use that way. 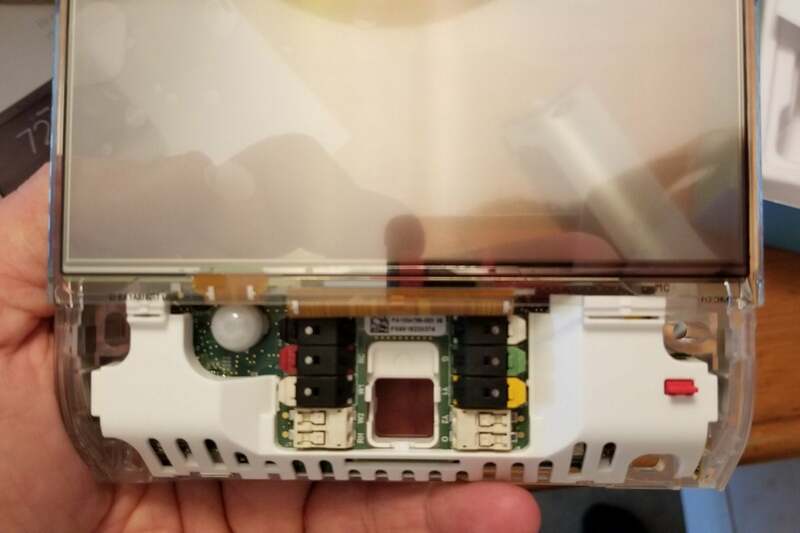 It’s worth noting that the GLAS’s motion sensor requires you to be very close (basically right in front of the thermostat) before it will activate its display. The Nest, in comparison, lights up if you come within around eight or so feet of it. All the thermostat’s settings are also available via the app, of course, for those who prefer to use a mobile device (and for when you wish to control the thermostat from afar). I encountered a few instances where the app simply wouldn’t connect to the thermostat and I had to reset the GLAS to fix the problem. That should be an easy enough bug for Johnson Controls to squash. The GLAS smart thermostat only looks as though it might snag your shirtsleeve as you walk by—there’s actually only about an inch of space between the display and the wall. For temperature control, the GLAS blends the AI-powered guesstimation techniques of the Nest Learning Thermostat with the hand programming of a more traditional smart thermostat. You can use the touchscreen to establish your preferred temperature ranges for the times you expect to be awake and asleep. You can also create special “away” schedules. Apart from that, it’s a hands-free device. The GLAS is also outfitted with a motion sensor that can help the thermostat determine when the home is occupied and when it’s empty. Like the Nest, the GLAS logs this activity and looks for patterns. It can also take into account how long it takes your system heat or cool to reach your temperature targets, so that your home will be comfortable when you wake up or arrive home. In a departure from most other thermostats, the GLAS can also evaluate the quality of the air in your home. Onboard sensors monitor relative humidity, total Volatile Organic Compounds (tVOCs), and equivalent CO2 (eCO2) levels. And by reaching out to the internet, this thermostat also displays outdoor air quality and pollen counts, which is exceedingly helpful for folks with allergy or other respiratory issues. If the GLAS grades air quality as Fair or lower, it will warn you and, if your system supports it, turn on its fan to circulate the air. If your system supports it, it will also pull in air from outside to freshen it. This is a terrific feature with the potential to improve the quality of your home’s air. The GLAS comes with very good documentation and an in-app walkthrough. As I’ve already mentioned, wire connections are made on the front of the thermostat. You push the wires through a hole near the bottom and mount the thermostat to the wall. As with most smart thermostats, you’ll need a C (common) wire for power, but Johnson provides a converter if that wire isn’t present in your installation. Once it’s on the wall, that big bright touchscreen makes the rest of the setup a smooth process. As usual, you’ll need to create an account with the manufacturer, via the app or a web browser, connect the GLAS to your Wi-Fi network, pair it with the app, and answer a few questions about your HVAC system and temperature preferences. That’s pretty much it. Wiring the thermostat from the front is easier than the more typical two-piece designs we’ve reviewed. The GLAS’s OLED touchscreen, its fabulous user interface, and its air-quality monitoring feature is fantastic. The benefit of embedding a Cortana smart speaker in this smart thermostat isn’t as clear, but Johnson Controls covered its bases by supporting Amazon Alexa and Google Assistant, too. So the question is: Does all of that justify the GLAS’s $319 price tag? Our current favorite smart thermostat, the Ecobee4, is street-priced at $230 and includes a remote sensor. Our runner-up pick, the Nest Learning Thermostat 3rd generation is street-priced at $212 and supports $40 add-on remote sensors. Johnson Controls intends to add sensor support in 2019, but that feature is not there today. Cortana could become a major force in the smart home down the road; it would be foolish to count Microsoft out this early in the game. As for the GLAS itself, it’s powerful enough to remain in contention for our top recommendation in this category. But it’s not there today.